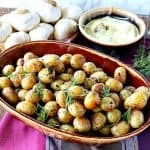 Roasted Baby Potatoes with Garlic & Fresh Herbs are creamy in the center, and brown and crispy on the outside. Pair all that deliciousness with a dipping sauce made of mustard, horseradish, and mayonnaise and you have the perfect side dish, or even a fun and unusual party appetizer!! YUM!! 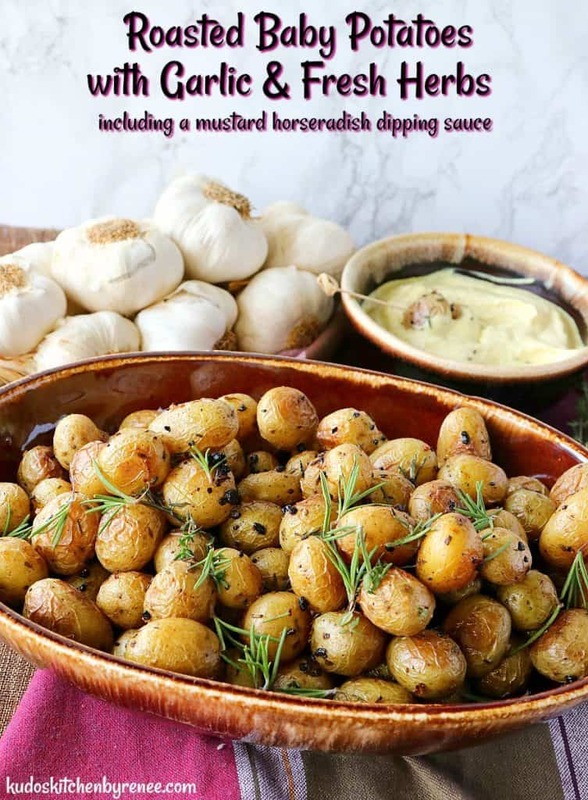 **Please Note – The printable recipe card with detailed instructions, complete ingredient measurements, and nutritional information for making Roasted Baby Potatoes with Garlic & Fresh Herbs is available near the end of this post. When roasting potatoes (or even vegetables) in the oven on a baking sheet, it’s always a good idea to preheat the baking sheet first before adding the ingredients. This way the ingredients will get off to a great start browning, first thing, even before they hit the hot oven! I have made these ahead and then reheated them in the oven at 350-degrees for 10 minutes. Before reheating, bring them to room temperature to ensure that they’re heated through quickly. I do not suggest microwaving them to reheat. The oven will give you the crispy exterior you desire. Great question. I hope this helps. FYI: The dip can be made several days in advance and stored in an airtight container in the refrigerator. Below is the printable recipe card for today’s Roasted Baby Potatoes with Garlic and Fresh Herbs. 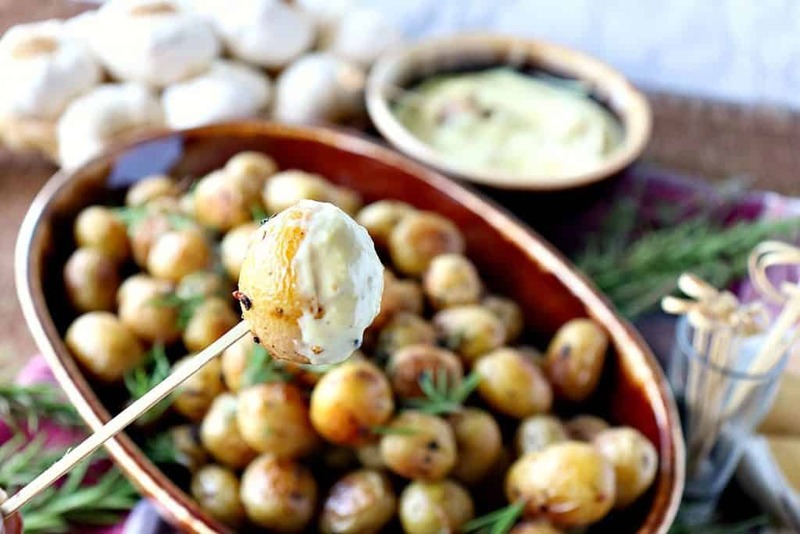 Roasted Baby Potatoes with Garlic & Fresh Herbs are creamy in the center, and brown and crispy on the outside. Pair all that deliciousness with a dipping sauce made of mustard, horseradish, and mayonnaise, and you have the perfect side dish, or even a fun and unusual party appetizer!! Preheat oven to 425-degrees, and add an empty baking sheet to the oven to heat while preparing the potatoes. In a large bowl, toss the potatoes with the olive oil, salt, pepper, garlic, and fresh herbs. Remove the hot baking sheet from the oven and add the potatoes in an even layer onto the hot baking sheet. Roast the potatoes for 20-25 minutes, stirring them once during the roasting. In a medium bowl, stir together the sauce ingredients. Serve the dipping sauce with the hot, or room temperature roasted potatoes, if serving as an appetizer. 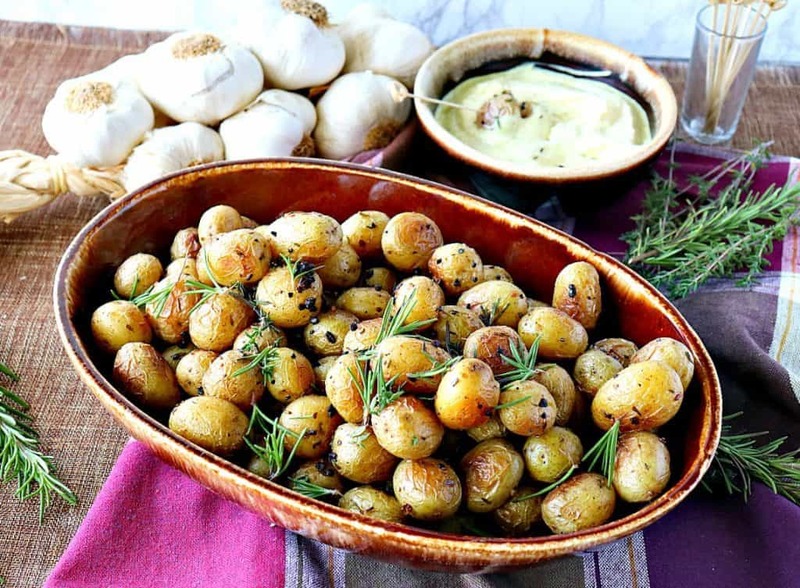 I sincerely hope you’ve enjoyed today’s recipe for Roasted Baby Potatoes with Garlic & Fresh Herbs as much as I’ve enjoyed bringing it to you! OH my goodness! These look amazing! And that mustard sauce! YUMMMYYY!!!! 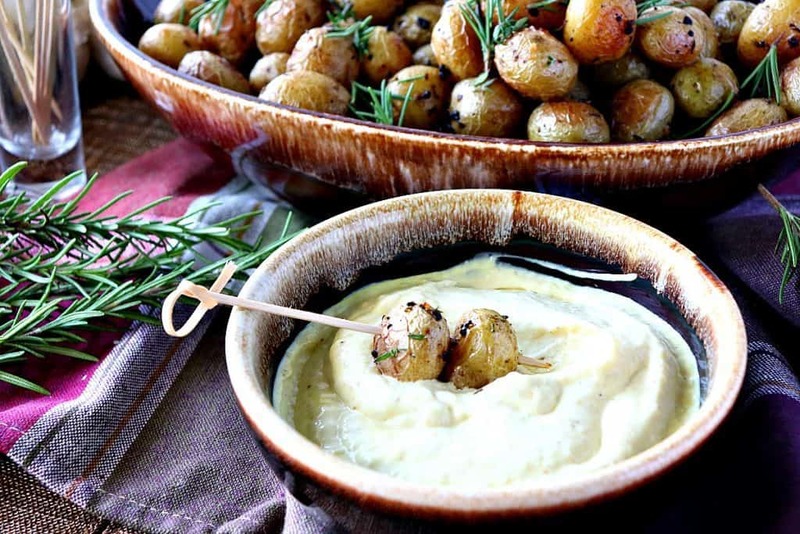 The mustard sauce is the perfect compliment for the roasted potatoes. I’m glad you like it, Kasey! 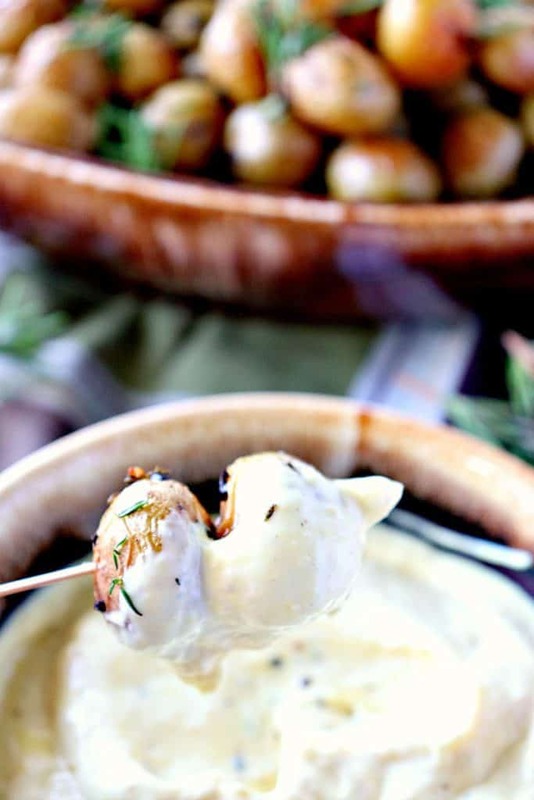 Roasted baby potatoes are my very favorite and this sauce takes it to a whole ‘nother level!!! Thanks, Wilhelmina! Glad you think so. I agree!! 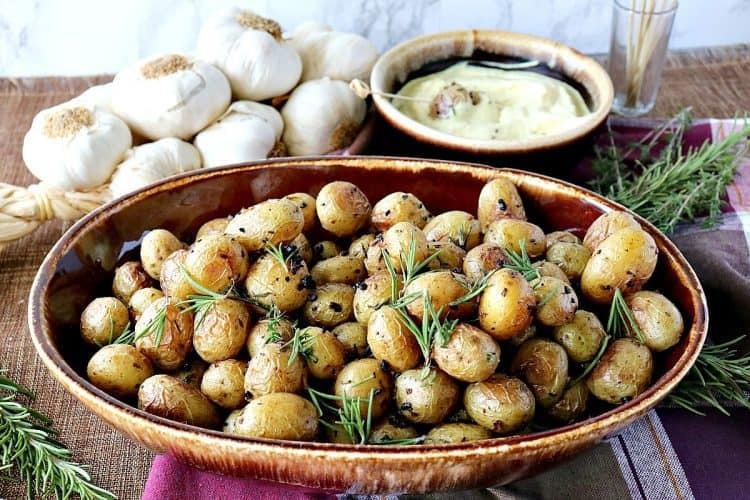 This is exactly what I was looking for – roasted whole baby potatoes with garlic. I’m doubling the recipe for a crowd. Thanks so much for sharing this. You are a girl after my own heart, Sue. Bring on the garlic and potatoes!! Enjoy, and have a fantastic day!